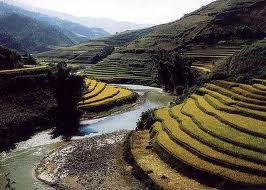 Sapa terraced field is in the list of “top 7” most magnificent terraced field in the world. The Travel and Leirsure Magazine (America) has just announced seven most magnificent and beautiful terraced fields in Asia, voted by readers. One of those name is Sapa – Lao Cai province. 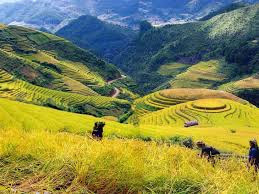 Seven most beautiful terraced fields in Vietnam are: Banaue (Philippines), Yuangyang (Yunnan – China), Ubud (Bali – Indonesia), Annapura (Nepal), Mae Rim (Chiangmai – Thailand), Sapa (Lao Cai – Vietnam) and Long ji (Qulin – China). Visitors could join the journey by train from Hanoi to Lao Cai city, then catch the bus/van from railway station to Sapa town before watching the harvesting fields with friendly H’mong and Dzao girls in their colorful custumes. Being the semi-climate subtropical area, and it needs to wait for the rain to be able to cultivate in May or June. This is the time for best scenes in summer of terraced fields in Sapa high mountains, Bac Ha, Bat Xat, Xi Ma Cai. Terraced fields in Lao Cai have been made for hundreds of year and by the skilful hand of Dzao, Hmong, Ha Nhi, Giay, Tay, Xa Pho, etc people. The terraced fields are not only the masterpiece but also the mobilizing basket of seed of the mountainous people. This is the effective way of cultivating and help in producing the tourism products for Lao Cai for many years. The terraced field in Lao Cai is also an interesting destination of international visitors and South Vietnam’s visitors everytime they come to South West area. The purposeless lines of Sapa “artists” have attracted many visitors.